Attitudinal Healing 2013 - Making a Difference! Join us at the Founders' Blog and be a part of the ongoing international conversation! Attitudinal Healing in Medical Practice and in Life with John Overton M.D. It is humbling to reflect back 40 years to a small group of seriously ill children gathered by a doctor who was himself afraid of dying to create the first Support Group of its kind. The Principles guiding them through their emotions and past their fears became the foundation for the first Center for Attitudinal Healing. Requests for groups rapidly grew as did innovative ways to adapt Attitudinal Healing across cultures as illustrated in the following stories. Nearly four decades later, we and our dedicated Staff, Volunteers, and Centers guide AHI's organic growth in over 30 countries on six continents. Support services remain free of charge thanks to the generous donations of individuals and private Family Foundations. We welcome Trish Ellis as the International Communications Coordinator for Attitudinal Healing International. She brings 27 years of Attitudinal Healing experience and is the coordinator for the 40th Anniversary International Conference and Gala in San Francisco September 19-21, 2014. Come join us with many others from around the world. Gerald Jampolsky, M.D. and Diane Cirincione-Jampolsky, Ph.D.
Meneesha and Patrick Michalka are second generation Attitudinal Healers, who are continuing the family tradition in Perth, Australia. In 1986, Meneesha's parents, Patricia and Donatus Michalka, established the retreat center at Serpentine, and in 1988 began the first CAH in Australia. Meneesha and Patrick continue to facilitate the Young Adults group that they both participated in as youngsters, and have recently initiated two very successful new programs at the Perth Centre. The first is Children's Wilderness Day for children living in refugee camps. "Grounded in AH and through free play and exploring out in the bush, the kids were able to safely share their stories, explore their feelings, and also just be kids. We are really excited that this program has become a reality." The second innovative program is a practical and uplifting workshop for people facing the challenges of depression or anxiety and their loved ones. Based in Attitudinal Healing, it teaches skills to overcome anxiety and depression and helps participants learn and develop techniques to identify the root causes of their anxiety. It is presented by medical and clinical professionals and individuals who have lived with depression or anxiety and learned to thrive not just survive. 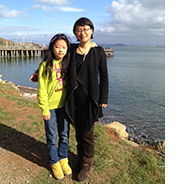 In October 2012, Elsa Cheng, shown here with her daughter in Sausalito, and her friend James Hu, contacted Attitudinal Healing International to inquire about starting Attitudinal Healing Support Groups and Centers in China. After many discussions, everyone agreed to offer a five month, bi-weekly on-line Attitudinal Healing training using Cisco's WebEx Conference Service. Jerry and Diane presented the initial introductory lecture in early January 2013 to over 400 people in 22 cities throughout China. Over the next five months, with the generous support of Elsa and her wonderful team of coordinators and translators, Carolyn Smith and Trish Ellis offered the course, Introduction to Attitudinal Healing. Elsa has introduced AH to teachers and parents, started weekly support groups, and incorporated the Center for Attitudinal Healing - Beijing. They are currently planning Attitudinal Healing workshops and Facilitator Trainings in Beijing and Shanghai November 8-18, to be facilitated by Trish Ellis, Carolyn Smith, and Joe Keery. Everyone is enthusiastic about the vision for Attitudinal Healing in China which is unlimited. On May 25, 2013, CECURA (Centro de Curacion de Actitudes) in Mexico City, the first Attitudinal Healing Center in Mexico, celebrated its 25th Anniversary. Through the love, devotion and hard work of its founders, Maruja and Gerardo Candana, and their many volunteers, CECURA has flourished and expanded -- not only throughout Mexico, but also into Cuba, the Dominican Republic and Colombia. AHI Founders Jerry and Diane joined the participants from twenty seven locations and nine different Centers who attended the anniversary celebration. CECURA now serves the Mexico City communities through sixteen weekly support groups and frequent workshops on various topics, including the most recent "Awakening Inner Power." In the year ahead, Maruja is planning on-line Attitudinal Healing trainings for South and Central America, Spain, Mexico and Spanish-speaking United States through AHI's WebEx training portal, as the next step in CECURA's growth. In 1993, while attending the fifth anniversary celebration of CECURA Mexico City, Carlos and Lucero Aguirre were inspired to establish an Attitudinal Healing Center in their own community in Guadalajara. This year, AHI Founders Jerry and Diane joined CECURA Guadalajara to celebrate their 20th Anniversary on September 21st. The occasion was marked with festive gatherings to honor volunteers and group members, a special lecture by Jerry & Diane, and the launch of a new "Power to Choose" program at Atala Apodaca public school. This 12-week pilot program includes the largest school research study in the history of Attitudinal Healing, encompassing the entire student body, their parents and teachers. The leadership team, headed by Lucero Aguirre includes the school principal, local educators, seven members of CECURA, and an educational researcher to collect and analyze the data. Currently the Power to Choose Program includes grades seven through twelve and is being used in a number of countries. By early next year the program will be available for grades one through twelve. CECURA Guadalajara has also adapted Attitudinal Healing to create a 100-day program for addicted inmates in the Puente Grande Prison in Guadalajara. The program is a combination of Attitudinal Healing, Pastoral Counseling and Alcoholics Anonymous. Over the past eight years, 1360 inmates have elected and been accepted to participate in the program. The current group of forty men attended the session that Jerry and Diane visited. They have been using "A Mini Course for Life" and Patsy Robinson's "A Definition of the Principles of Attitudinal Healing" as texts to guide them in their instruction. The compassion and love of the staff, facilitators, and the assistant warden, as well as the amazing sense of brotherhood among the men was heartwarming. They expressed excitement about how they have changed their thoughts and attitudes about their past, their incarceration, and their possibilities for the future. They clearly verbalized the value of having inner peace as their only goal. Their ability to forgive others and themselves was profound. They expressed that the Principles of Attitudinal Healing will continue to be their guiding force for changing their minds and changing their lives. This program promises to be a model, not only in Mexico, but in countries around the world. It has a sobriety success rate of approximately 70%, which is signicantly higher than most known programs. 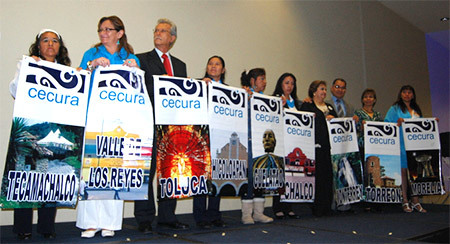 Watch the CECURA Guadalajara website for ongupdates on these exciting programs. 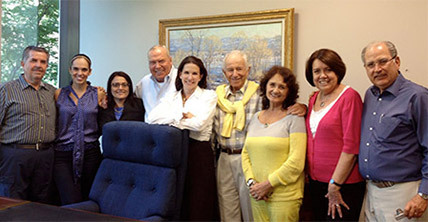 CECURA Santo Domingo, founded in 2009, is one of the newer members of the CECURA family of AH Centers. In August 2013, they invited Aeeshah and Kokomon Clottey from AHC - Oakland to mentor them and to present two innovative workshops: "How to be Happy Together" and "Leading from Within." Participants in both workshops enthusiastically engaged in the many dynamic expressions of AH that included drumming, movement, and a variety of opportunities for genuine communication. "The Clottey's showed us that any vision based on love and linked to right action results in the multiplication of peace, joy and love in ourselves and those around us." Donna Richards, a member of the Heartlight Attitudinal Healing Center in Fayetteville, New York, recently introduced Attitudinal Healing to the Gambia Starfish Foundation, where it is now incorporated into the foundation's educational and empowerment programs for girls. Starfish International is a 5-year-old non-profit grass roots program whose goal is to empower Gambian girls by providing them an advanced education emphasizing service to humanity. Starfish educates 100 girls annually, focusing on leadership training and character education. Starfish invited Donna to bring AH to the girls to help them deal with their fears and develop their emotional toolbox. With Heartlight's support and guidance, Donna taught a 12-session class to the oldest students. Jerry and Diane opened the first session via Skype, introducing basic AH concepts and answering questions. Following the 12 sessions, students started their own AH Support Group which they named "Starlight." They meet regularly, with Skype support from Donna. The older girls are mentoring the younger ones. Co-founder Yassin Sarr-Fox has already seen the positive impact of AH: "Starfish is working to provide the Gambian Girl with an educational experience that will enable them to serve humanity with their best and their most complete selves. Their AH experience sets the foundation for them to come to terms with who they truly are and how they can most rewardingly live with the rest of their human family. From this standpoint, they emerge from the program as fuller human beings poised to add positivity to the human condition." 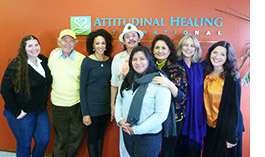 Attitudinal Healing Connection (AHC) in Oakland, California could be called the "Super Hero" of Attitudinal Healing Centers. It is certainly a model for what is possible when vision, commitment and action come together in a powerful way. From the beginning AHC has envisioned how Attitudinal Healing's self-healing tools, practices, and concepts could transform the lives of individuals living in stressed communities. Attitudinal Healing addresses the disparities created by poverty, violence, and racism, and is grounded in the understanding that true transformation requires a shift in perception from fear to love. AHC's 24th year has been one of tremendous growth and innovations. 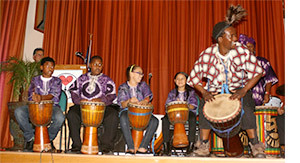 ArtEsteem, the award-winning program, has expanded to numerous schools. Oakland's Super Heroes Mural Project has grown to be the city's first large scale mural revitalization and beautification project which includes community and youth engagement, school partnerships, and civic engagemen. The Youth Leadership Now (YLN) continues to influence urban youth by fostering self, cultural and community identity through local and international community engagement and creative educational projects. AHC has now taken their programs to Guadalajara, Mexico; Santo Domingo, Dominican Republic; Accra and Kumasi, Ghana, West Africa; and Abuja, Nigeria. Executive Director, Kokomon Clottey shares his perspective: "We see our work continuing to deepen as we focus on collective impact. The solutions that we are envisioning and manifesting will take every one of us working together." Els Thissen, founder of Stichting Centrum voor Attitudinal Healing, Holland, traveled to Bethlehem in September to teach AH and offer support groups. 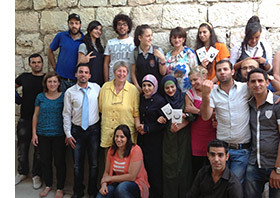 During her visit, Els worked with nine different groups including children, community elders, and staff members from the Arab Educational Institute. Els' vision is to organize an international Attitudinal Healing Training in Bethlehem to train Facilitators to offer support groups to the local community. In one of the groups, a young Palestinian woman told a story that offers hope for healing: "When I was four months pregnant I lost my baby because of tear gas. I was terribly depressed since it was the second miscarriage I suffered. A week later I visited a medical doctor in Jerusalem for a check-up. Coming out of the doctor's clinic I saw nearby, on top of an escalator, an Israeli child who was about to fall down the escalator. Thoughts rushed through my mind. Should I leave him and let him die the way my boy died a week ago, or should I make a desperate attempt to grab him? All of a sudden I felt an impulse that made me hurry forward. Throwing myself in front of the boy I prevented his fall." The woman shared with Els that since that day she only feels peace in her heart. Her sharing reminded others of their deepest wish and longing to live with a peaceful and open heart. 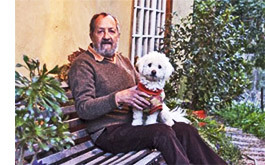 After a career in psychology, Pieter Smit, seen here with Co-Director Charlie, retired in 1989 and constructed an eco-friendly straw bale house in Little Karoo, Steytlerville, South Africa. The house is now home to the Centre for Forgiveness and Attitudinal Healing. 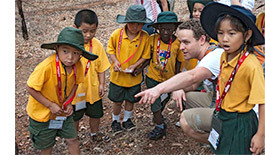 Although the center opened in 2003, Pieter did not begin offering AH programs until 2011. In the beginning, he gradually incorporated AH concepts into other educational classes that were more easily accepted within the community. As the community became more accepting of self-awareness and self development concepts, Pieter was ready to train facilitators and begin AH Support Groups. Pieter was trained as an AH Facilitator by Els Thiesen, founder of the Attitudinal Healing Center in Holland. Since 2011, he has offered Facilitator Training courses in his local community, as well as many other South African towns which include Mossel Bay, Oudtshoom, De Rust, Cape Town, Algoa at Nelson Mandela Bay, Stellenbosch and Port Elizabeth. AH Support Groups are now offered in each of these towns. Pieter translated the Principles of Attitudinal Healing into Afrikaans and offered the first Afrikaans language training in June this past year. 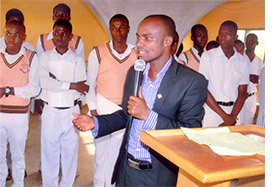 David Owusu from Kumasi has worked with youth for several years - before, during, and after college. He founded an organization called "Citizens for a Better World" to empower youth to develop healthy values and to become contributing citizens. David's education is in rural development and water quality supply. With AH, he is helping rural people understand that it is possible to improve the quality of their lives without leaving their homes and migrating to the city. Since David first contacted AHI in December 2011, he has incorporated AH into his work with youth by offering the Power to Choose Program in four schools and conducting two weekly AH Support Groups. He recently filmed a delightful video in which members of the group share their understanding of the AH Principles. The students hope to attend a Facilitator Training and start groups of their own. 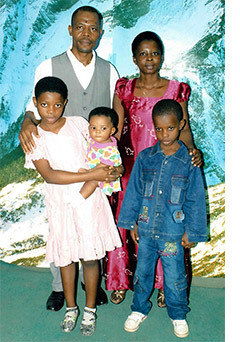 Tasha Abdou, seen here with his family, contacted Jerry and Diane in 2008 after reading Love is Letting Go of Fear and using the lessons to overcome seemingly insurmountable problems. Tasha continues to apply the Principles of Attitudinal Healing to life's many challenges, and helping others to do the same through his weekly Attitudinal Healing radio program and AH groups and workshops. Tasha's peace of mind was recently tested in a most dramatic way. At 1 am, four armed men awakened the family pretending to be injured and needing medical attention. They barged into the medical clinic operated by Tasha and his wife, threatened their lives, and stole everything of value, including Tasha's only form of transportation, his motor bike. "Lying face down on the floor I was busy trying to find the pain that would make people become such merciless thieves. I realized it was the attachment the ego has toward material wealth that overshadows the need for love shining in the faces of these guys. Instantly I felt a sense of relief and kindness towards their situation and I felt deeply peaceful. I realised one can be peaceful even in a very hard situation like this. These guys have taken almost our entire livelihood, but here I am feeling peaceful and wishing they could see how much love I have for them. Thanks to Attitudinal Healing, I have truly been transformed. Giving love even to supposed enemies, I feel a deep inner peace. My wife and I prayed for them to see the light, not in the things they consider valuable but in love and joining with the entire community. I dedicate this, my new found self to all of you and to tell you how much good your work is able to do even in a remote village in Africa. The Principles of Attitudinal Healing truly transcend cultures and colors."